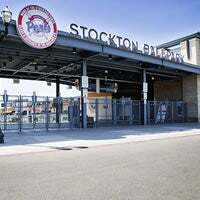 After playing at Billy Hebert Field in Oak Park since 1950, the Stockton Ports moved into their new waterfront home at Stockton Ballpark in 2005. Stockton Ballpark is owned by the City of Stockton, and was designed by KHS, Inc. The ballpark was built as part of the revitalization project for the Downtown Stockton Waterfront area, and was built concurrently with the Stockton Arena. The Banner Island area, where the Stockton Ballpark currently stands, is allegedly the home of the Stockton baseball team which played in the late 1800s, in an area known as “Mudville” along the San Joaquin River. Banner Island was once an island in the San Joaquin River delta. Although the area is no longer an island, the name remains. Because of the history surrounding Banner Island Ballpark, the stadium was given a historical certificate and named a historical site on August 10, 2008 by the Stockton Cultural Heritage Board.